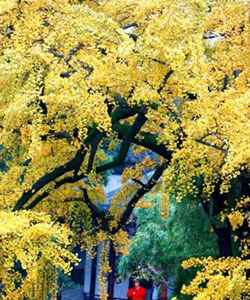 Last summer we filmed a huge Ginkgo tree in the park of the Castle in Hluboká, (Czech Republic). It must really be very old. It was full with fruit, so I took one with me home to try to sow it. I should have looked for your (very nice) homepage before, to get the instructions. Now I just had put the whole fruit in a flowerpot in the window. The result was that the seed had rotten. Thanks for the nice pages.